Before the Saddledome set the record for their suspended roof, there was the smaller scale Utica Memorial Auditorium. Known locally as The Aud, it was the first arena of its kind to use a long-span cable structure was only seen up to that point in suspension bridges. It uses two layers of cables an outer ring that best resembles the spokes on a bicycle wheel and is exposed in the arena for an interesting architectural view. It allows for unobstructed views for the 4000 spectators. 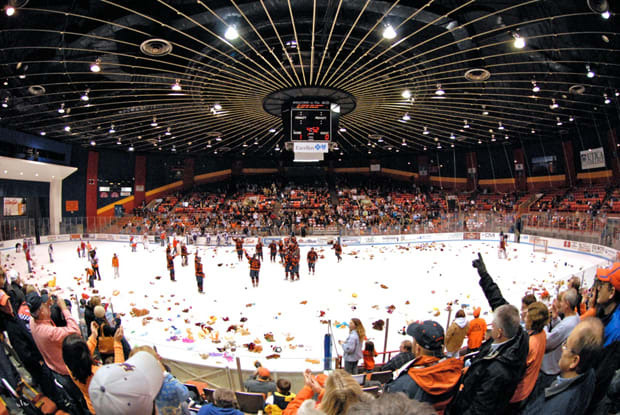 While professional hockey left The Aud in 1993, it’s still home to the Utica College Pioneers.